This line from Lewis Carroll's immortal story seems most apt for Indians, who, much like Alice, went “Down the Rabbit Hole“ and now find themselves at a “lovely garden“ where a variety of digital currency bouquets are in bloom. And, there seems to be no getting out of this garden. Prime Minister Narendra Modi's dramatic demonetisation move more than two months ago not only surprised every Indian but also opened the floodgates for the emergence of a digital economy and turned around the fortunes of some companies. Consider PaySe, an offline digital payment solution with just about two products in its kitty aimed at the unconnected and unbanked population.After the demonetization, the Nucleus Software supported startup quickly launched two more products ­ a sleek, chip-based payment band with the capacity to store digital cash and a microSD card, which works in mobile phones. “It's a booster shot given to us. I told myself... Wow! We can now cater to consumers more effectively.Earlier, we were a peer-to-peer solution. The demonetization took us to a different orbit,“ Ashutosh Pande, founder of PaySe, told ET. The company considered developing the payment band, which is easy to carry and pocket-friendly after women customers complained about the difficulties of carrying a smart card. “It's like opening up of new doors as we are moving forward,“ Pande said. PaySe will introduce a smartwatch, expected to be in the market next month. 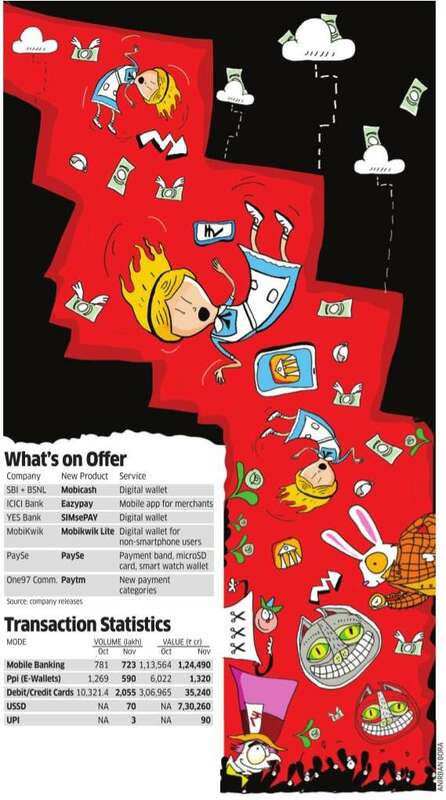 If Rip Van Winkle were to have woken up from his slumber in India today, he would have found himself in a digital wonderland, where the milkman accepts payment by cheque without a fuss, a man buys a geometry set worth about Rs 100 for his daughter using a credit card and the vegetable vendor uses a digital wallet. Banking apps and digital cash solutions are all the rage in India now. Ever since the demonetization was announced on November 8, almost every bank and solutions provider has either upgraded existing digital devices or lined up new solutions to take advantage of the opportunity that has come their way. The goal of banks and mobile wallet solution providers now is to broaden the acceptance of digital payment offerings. Although India has 107 crore mobile phone subscribers, only about 30 crores of them ­ 28% ­ have smartphones. The endeavor now is to bridge this gap by bringing feature phone users into the digital world, which they're doing by forming partnerships with telecom companies, offering solutions that don't need the internet to work and opening up new avenues of payment categories (see box 1). The government, too, is taking steps to promote digital payments as it seeks to curb black money. It is pushing BHIM (Bharat Interface for Money), a mobile payment app based that on UPI (Unified Payment Interface) for banks and USSD (Unstructured Supplementary Service Data) modes of e-payment.It can be activated with fingerprints and the government is looking to integrate Aadhaar with the BHIM app, making the 12-digit identification number a universal payment ID. With UPI, money can be transferred from one bank account to another without an intermediary and the money stays in the consumer's account until the transaction is complete. Paying through digital wallets needs a third party linking the payer and the payee. “Direct bank account transfers through UPI are safer than any e-wallet transfer,“ said Joy of Chillr. “Transactions through UPI also match the speed and convenience of e-wallets.“ The Sequoia Capital-backed startup is working with a dozen banks for funds transfer through immediate payment service (IMPS). However, e-wallets such as Paytm, Freecharge, and MobiKwik have been around for a couple of years and enjoyed a bull run soon after Modi invalidated Rs 500 and Rs 1,000 currency notes. The Reserve Bank of India has said the enhanced limit of e-wallet and prepaid instruments ­ Rs 20,000 per month ­ will continue until comprehensive guidelines come in. Banks, with the help of the NPCI, are also going strong on USSD-based transactions. USSD is a payment system that can be used on mobile phones without internet connection. While the use of cash alternatives such as internet banking, e-wallets and credit cards increased in November from the previous month, there wasn't always a corresponding increase in the value of transactions. Debit card transactions actually fell in terms of both value and volume. The missed trend likely reflects how consumers, forced into the tunnel of digitization, are using more than one digital option to make payments or simply cutting down on spending. Like all other new products, there are worries about the safety and the cost of digital transactions. Apps downloaded on smartphones require access to information stored on the devices, which are more vulnerable to hacking or malware attacks. Although the government has slashed fees and commissions charged e-payment operators to encourage a cashless economy, digital transactions can't be completely free of cost. Besides commissions, consumers have to spend on data. For Alice, it was a dream. For Indian digital service providers, it's a dream coming true. And for consumers, there may not be reason enough to get out of the digital cash wonderland because convenience trumps potential threats.